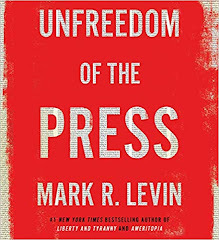 From five-time #1 New York Times bestselling author, FOX News star, and radio host Mark R. Levin comes a groundbreaking and awe-inspiring book that focuses on the damage U.S. media imparts upon the country. Levin demonstrates that the media has degenerated into a standardless profession that has squandered the faith and trust of the American public, not through actions of government officials, but through its own abandonment of reportorial integrity and objective journalism. With the depth of historical background for which his books have comes famous, Levin takes the reader on a journey through the early American patriot press, which proudly promoted the principles set forth in the Declaration of Independence and the Constitution, followed by the early decades of the Republic during which newspapers around the young country were open and transparent about their fierce allegiance to one political party or the other. It was only at the start of the Progressive Era and the twentieth century that the supposed “objectivity of the press” first surfaced, leaving us where we are today: with a partisan party-press overwhelmingly aligned with a political ideology but hypocritically engaged in serial propaganda campaigns.